Consumer print magazines are indeed climbing out of a big downturn…Conde Nast and it’s harem of luxury magazines are just one example, other magazines are also reporting increases in ad pages and revenues (see my 12 July post). As I have mentioned before on this blog, I am of the opinion that much of the rebirth of magazines (and newspapers) print popularity is due to online digital exposure…much of it free. Now if they can just get the online digital monetization and paywall thing solved…a new publishing business model might be in our presence! Luxury magazines, like the economy, are making a slow comeback. On Monday, Vogue magazine will announce ad-pages results for its all-important September issue, and industry insiders say that the fashion monthly will show a spike of 100 advertising pages, or 23% over a year ago, for a total of 529. The relatively improved economic climate has been boosting numbers for Vogue’s sister titles at Condé Nast, the most luxury-oriented of the major magazine publishers and the one that was hardest hit by the downturn. But even 23% growth for the September issue—in which designers and fashion companies display their next season’s lineups—barely puts Vogue back in the league it was in a few years ago. In 2007, the magazine carried a record 727 ad pages—and weighed in at four pounds nine ounces. 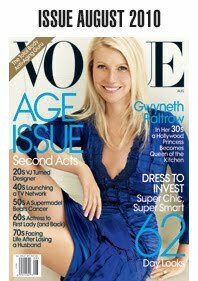 In 2008, Vogue dropped 7% of its ad-weight, coming in at 674 pages. Condé Nast will release the September issue information at 6 p.m. on Monday. Vogue Publisher Susan Plagemann declined through a spokeswoman to comment. Once known for sticking closely to its rate card pricing and only offering discounts to advertisers making large corporate deals, Condé Nast has become more flexible in its negotiations over the past year, according to media buyers and executives at rival publishers. Insiders say that Vogue has not been an exception, and that some of the increase in paging is the result of deals in which digital advertising inventory was essentially given away. Others point out, however, that Condé Nast still markets its titles at a premium and that Vogue’s latest numbers show a marked improvement from the devastation of a year ago, when pages plunged 36%. “Condé Nast is perhaps bending a little on what we call ‘added value,’ but I don’t think you can attribute a 100-page increase just to that,” said Roberta Garfinkle, director of print strategy at media buying agency TargetCast tcm.